Dozens of potentially habitable planets have been discovered outside our solar system, and many more are awaiting detection. The hunt for life in these places, which are impossible to visit in person, will begin with a search for biological products in their atmospheres. These atmospheric fingerprints of life, called biosignatures, will be detected using next-generation telescopes that measure the composition of gases surrounding planets that are light years away. It's a tricky business, since biosignatures based on single measurements of atmospheric gases could be misleading. To complement these markers, and thanks to funding from the NASA Astrobiology Institute, scientists at the University of California, Riverside's Alternative Earths Astrobiology Center are developing the first quantitative framework for dynamic biosignatures based on seasonal changes in the Earth's atmosphere. Titled "Atmospheric Seasonality As An Exoplanet Biosignature," a paper describing the research was published today in Astrophysical Journal Letters. The lead author is Stephanie Olson, a graduate student in UCR's Department of Earth Sciences. As Earth orbits the sun, its tilted axis means different regions receive more rays at different times of the year. The most visible signs of this phenomenon are changes in the weather and length of the days, but atmospheric composition is also impacted. 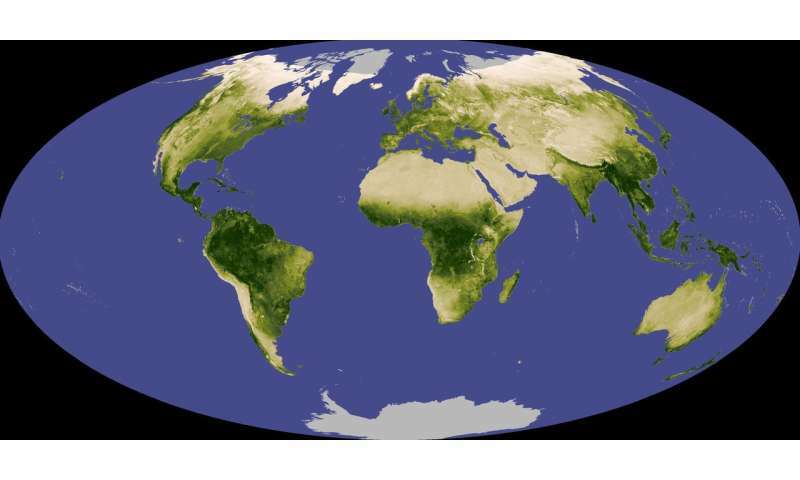 For example, in the Northern Hemisphere, which contains most the world's vegetation, plant growth in summer results in noticeably lower levels of carbon dioxide in the atmosphere. The reverse is true for oxygen. "Atmospheric seasonality is a promising biosignature because it is biologically modulated on Earth and is likely to occur on other inhabited worlds," Olson said. "Inferring life based on seasonality wouldn't require a detailed understanding of alien biochemistry because it arises as a biological response to seasonal changes in the environment, rather than as a consequence of a specific biological activity that might be unique to the Earth." Further, extremely elliptical orbits rather than axis tilt could yield seasonality on extrasolar planets, or exoplanets, expanding the range of possible targets. In the paper, the researchers identify the opportunities and pitfalls associated with characterizing the seasonal formation and destruction of oxygen, carbon dioxide, methane, and their detection using an imaging technique called spectroscopy. They also modeled fluctuations of atmospheric oxygen on a life-bearing planet with low oxygen content, like that of Earth billions of years ago. They found that ozone (O3), which is produced in the atmosphere through reactions involving oxygen gas (O2) produced by life, would be a more easily measurable marker for the seasonal variability in oxygen than O2 itself on weakly oxygenated planets. "It's really important that we accurately model these kinds of scenarios now, so the space and ground-based telescopes of the future can be designed to identify the most promising biosignatures," said Edward Schwieterman, a NASA Postdoctoral Program fellow at UCR. "In the case of ozone, we would need telescopes to include ultraviolet capabilities to easily detect it." Schwieterman said the challenge in searching for life is the ambiguity of data collected from so far away. False positives—nonbiological processes that masquerade as life—and false negatives—life on a planet that produces few or no biosignatures—are both major concerns. "Both oxygen and methane are promising biosignatures, but there are ways they can be produced without life," Schwieterman said. Olson said observing seasonal changes in oxygen or methane would be more informative. "A potentially powerful way to assess exoplanets for inhabitation would be to observe their atmospheres throughout their orbits to see if we can detect changes in these biosignature gases over the course of a year," she said. "In some circumstances, such changes would be difficult to explain without life and may even allow us to make progress towards characterizing, rather than simply recognizing, life on an exoplanet." Timothy Lyons, a professor of biogeochemistry in UCR's Department of Earth Science and director of the Alternative Earths Astrobiology Center, said this work advances the fundamental approach to searching for life on very distant planets. "We are particularly excited about the prospect of characterizing oxygen fluctuations at the low levels we would expect to find on an early version of Earth," Lyons said. "Seasonal variations as revealed by ozone would be most readily detectable on a planet like Earth was billions of years ago, when most life was still microscopic and ocean dwelling." The hunt for life in these places, which are impossible to visit in person . . ..
"Always with you it cannot be done." There are 9 man-made objects on their way out of the solar system right now. An interstellar object (Oumuamua) passed through our solar system earlier this year. Another 8 comets with hyperbolic trajectories might have interstellar origins. Don't be so quick to conclude all forms of interstellar travel are impossible. How to deduce that this clickbait headline is not just inaccurate but wrong? "Atmospheric seasons could signal alien life"
Try to reverse it with "Atmospheric seasons could NOT signal alien life"
An accurate rendition would be "Atmospheric seasons may possibly signal alien life"
At least then the writer would make it clear, that the researchers were intending to base eventual conclusions, from research still in progress, after achieving empirical evidence. Amazes me, the wishful mindset of people who want to hold a victory parade? Not just before the battle is won but even before the battle is begun! Look at the variety of headlines on this site using the word 'could'. All implying definitive conclusions without even preliminary evidence. Much less verified proof. Clickbait headlines of unsubstantiated speculations. "I could build an atomic bomb"
versus "I may possibly figure out, how to build an atomic bomb". This very issue of unconfirmed rumors, partisan accusations and deliberately misleading agitprop is exactly the rationale to goad Israel and the United States into attacking Iran. All to profit Saudi ambitions to dominate the Middle East. And Russian ambitions to treacherously waste our military resources. And both to artificially inflate oil prices. Leaving Iran in ruins for the Russians to surge south. Hooking around a castrated Turkey, for those long desired warm water ports. "The Great Game" is still in play, Baby! A favorite Russian quote that is pithy to such creative headlines... "Fornicate your mother, if you can't take a joke!" "I may possibly build an atomic bomb"
Sorry 6B, but I gotta disagree with your assessment of a the meaning of both statements. is a conclusion, confirming that I am capable of producing such a device. No proof, just unsubstantiated speculation. As with all those clickbait headlines I am deriding. "I may possibly build an atomic bomb" I am unsure if I am able to produce such a weapon. So don't push me into a corner where I am compelled to make the effort. The headline accurately reflects the content of the article, as it actually begins its own conclusion with the statement that, "Biogenic seasonality may be common among inhabited worlds". That's only incompatible with the headline if you're being deliberately dishonest. Now, if you wanted to actually be honest, you should address the paper instead of assuming that every one is eager to, "hold a victory parade".